My name is Sieng Sok Chann. In the past I used to walk like other people. When I was thirteen years old, Cambodia was still in the war. It was during the Khmer New Year on 16th April 1994. It was raining heavily, and people believed that if they shot guns through the air, the rain would stop. My back got injured – it was a bullet that got into my back bone. It broke my bone in the back. I realized I was a woman with disability, I could not change anything. Many people said to me that the life lived like this is very vulnerable, why don’t you go to die? They said words like this and made me feel very bad. I think the outside world really does not understand what the real difficulties are for women with disability like us. Most women with disability are embarrassed, feel ashamed to go in public and never join in the social life. But for me, I decided that I would forget about the past and must commit myself to be very strong. So I go to the market, I go to join different events and I make my life change. I can play sport; I can do anything with other people so I am quite happy. Even though I have had great sorrow and disappointment in the past, now I changed my life to be better for the future. I committed myself that I will help other women with disability, especially to make myself to be a strong model, to make sure people are not looking down on me because of disability. I don’t want people to say my spirit is disabled or my capacity is disabled – I really want to show the world I’m strong. One day I hope to start an organisation which will help the women with disability who live vulnerable lives like me, to make better life. I believe that women with disability who have a job to do and have good training don’t get depressed or feel hopeless in their life. I like teaching in the sewing school because I see that my knowledge could train people with disability, so they have a sustainable life and good job. 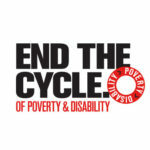 I know a lot of problems that women with disabilities face: disability could lead into poverty because you have no job to do, you can be more vulnerable. Most women with disability in my area are single mothers and with one kid. All of them have been given up or were never cared for by their husband, just like me. I repeat again and again, for women with disability it is really hard to live. Please consider disability issues. My son is called Sieng Lee, he is 6 years old and in grade one. My big concern is his education. I really worry what will happen in the future, because I have no money. His vision is to become a doctor.